Let’s get this out of the way first of all – thank God (or whichever deity you choose) for Hayao Miyazaki. In a world full of pretenders and puffed-up egos, the man is an unassailable genius. From Laputa: Castle in the Sky (1986), all the way through to his swansong, The Wind Rises (2013), Miyazaki has been responsible for providing audiences around the world with a succession of beautifully crafted, emotionally resonant animated movies that have been a feast for the eyes and a balm to the heart. And Porco Rosso (literally ‘crimson pig’) sits firmly within the pantheon of Miyazaki’s career as a director (and just as firmly as Fio’s behind in Porco Rosso’s rebuilt plane). The movie is another of Miyazaki’s grounded fantasies, with the title character (Moriyama) a veteran fighter pilot from World War I who now acts as an aerial bounty hunter, tracking down and putting out of business so-called air pirates operating above the Adriatic Sea. But Porco isn’t just a bounty hunter, he’s also an anthropomorphic pig, the victim of a curse that has no apparent cure. When Porco isn’t chasing down air pirates and saving groups of school children (a common occurrence it seems), he divides his time between the tiny island he uses as his base, and the Hotel Adriano, which is owned and run by the widow of one of his war-time co-pilots, Madame Gina (Katô) (she has feelings for Porco but he’s blissfully unaware of them). The hotel is also the meeting place for the leaders of the various air pirate gangs; they’ve arranged for a famous American flyer, Donald Curtis (Ōtsuka), to take on and defeat Porco when he next attempts to stop them from robbing a ship. The confrontation takes place as planned, but Porco’s plane – which has seen better days – lets him down and he’s forced to give Curtis the impression that he’s gone to a watery grave. In time, Porco returns to the European mainland, and travels to Milan in order to get his plane repaired. 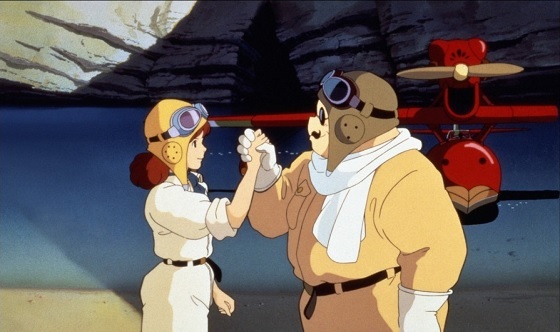 If Porco Rosso looks and feels as if Miyazaki has a stronger attachment to this project than usual, then the fact that it’s an adaptation of a three-part watercolour manga, The Age of the Flying Boat, by Miyazaki himself might offer a clue as to the reason why. 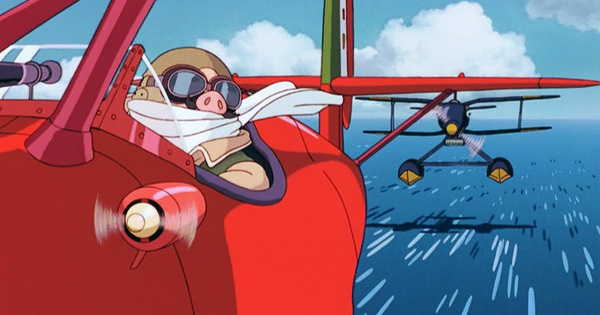 Miyazaki’s distrust of modern technology is evident in both the movie’s setting and the way in which Porco keeps faith with his plane – and despite its obvious failings in the movie’s opening third. And when his plane is redesigned by Fio, the materials that are used are in keeping with the original construction (only the engine could be considered an “upgrade”). All this is in keeping with Miyazaki’s environmentalist beliefs as well as his reoccurring notions of family, here represented by Piccolo’s workforce all being female relatives of his whose skills are required because the menfolk are absent. It’s these deft touches that add depth to the material, much of which is an ode to an earlier, simpler age, and Miyazaki, working from his own script, ensures there’s an added sense of poignancy in relation to a future where everything will change. 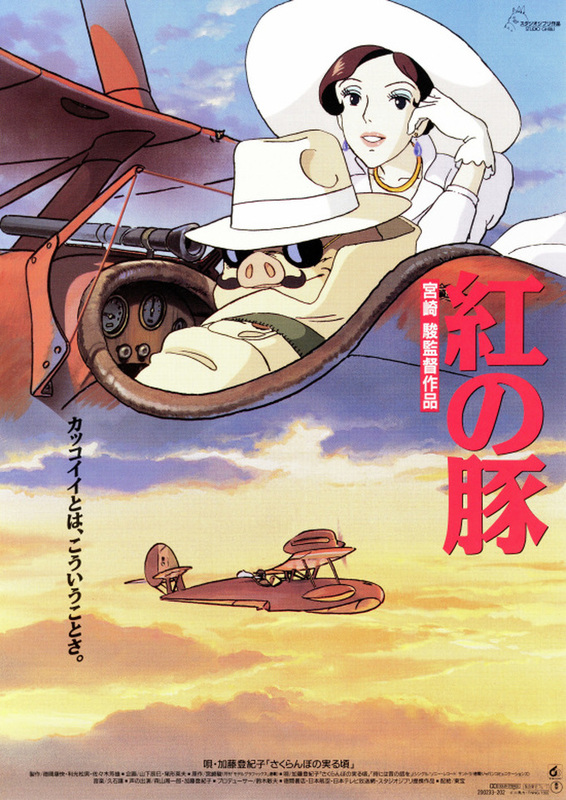 In many ways, Porco Rosso is perhaps the closest Miyazaki has gotten to making a Western. Porco is the lone gunslinger, quicker on the draw than anyone else, while Curtis is the young upstart looking to make a name for himself by bringing down the more experienced gunfighter. The Hotel Adriano doubles for a saloon, the air pirates are rustlers and bandits who rob stagecoaches, and Fio is the plucky young girl a la Mattie Ross in True Grit (1969). Further references can be made, and it’s fun to spot them as the movie zips along merrily in such good-natured fashion that finding fault with it soon proves to be a task of Herculean proportions. It’s an infectiously enjoyable movie, funny in a variety of ways and always aiming to please, always looking for new and different ways to surprise the viewer and improve their viewing experience. That it succeeds, and with such ease, is a testament to Miyazaki’s innate ability to tell a good story, and his unwavering commitment to the movies he makes (or since his retirement in 2013, made). This being a Studio Ghibli movie, the animation is suitably and predictably impressive, with sharp, clean lines; bright, vibrant colours; superb lighting effects; and wonderfully expressive characters. Some scenes have a painterly effect, as if you’re looking at a canvas in a museum of art, and there’s an incredible sense of space and movement that Miyazaki and his team pull off as it was the easiest thing in the world (which it probably isn’t). This is 2D animation at its best: richly detailed, painstakingly assembled, and often beautiful to watch or look at. With an amusing screenplay that doesn’t ignore or gloss over the inherent drama of Porco’s situation (particularly the dream-like sequence where he reveals how he came to be a pig), or aspects such as Madame Gina’s unrequited love for him, the movie flows as easily and as confidently as the waves depicted on screen.